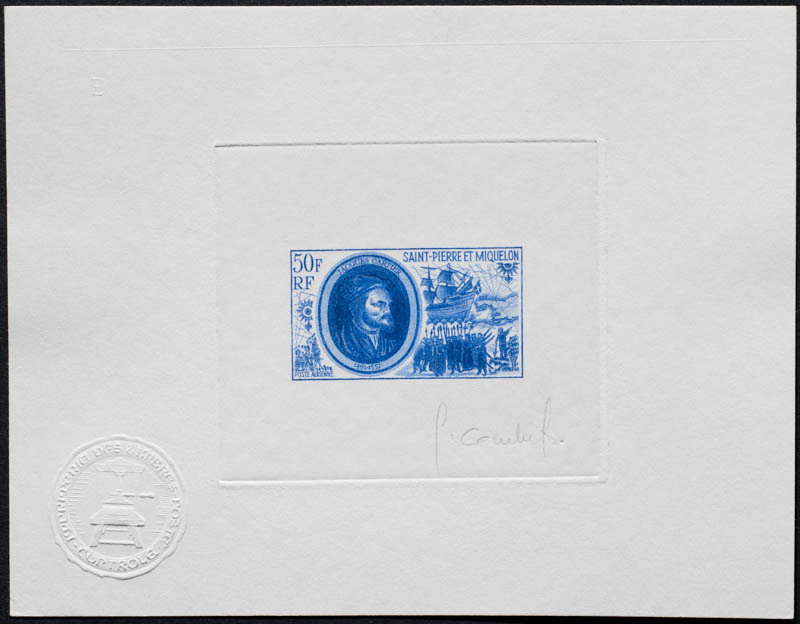 Artist's proofs of approximately 195 Saint Pierre & Miquelon stamps were produced from 1960-99. There were thus approximately 1,170 different color artist's proofs (195 x 6) and 5,070 total artist's proofs (195 x 26) produced during this period. In addition, 24 negative artist's proofs (140 different colors and 624 total) were produced. Images of about 540 Saint Pierre artist's proofs are shown in the gallery. The main engravers for St. Pierre are somewhat different than for the other French territories. For the period 1960-76, when the engravers also designed the stamp they engraved, 16 stamps were engraved by Combet, 11 by Gauthier, 10 by Forget, 9 by Pheulpin, and 7 each by Aufschneider, Jumulet, and Durrens. After 1985, there were 17 stamps engraved by Jumulet, 12 by Larrivière, 10 by Jubert, and 9 by Guillame, and 5 each by Combet and Rajewicz. The engraver had less of an impact on the design after 1985 because the stamps were designed by local artists rather than by the engraver.